Many of the Air Raid offense disciples around college football have strayed into the running game. It’s not any different for Craig Yeast, the former offensive coordinator at Franklin College, and recently named head coach at Kentucky Wesleyan. 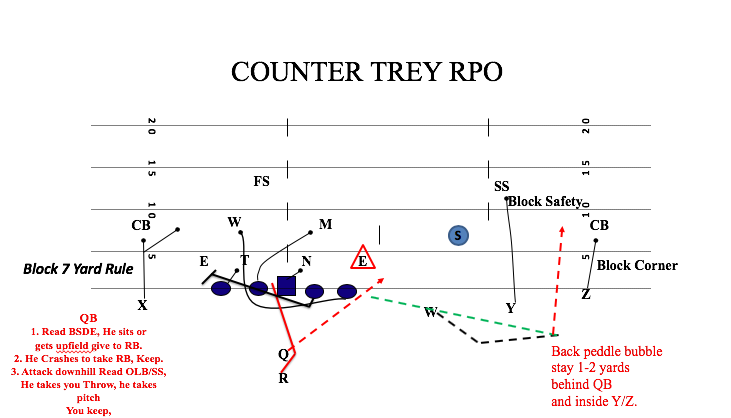 Coach Yeast was kind enough to share one of his favorite concepts he ran this past season at Franklin College, the counter-RPO. The counter concept used by Yeast is known as counter trey. This is when the offensive line pulls the backside guard and backside tackle. The guard will kick out the defensive end while the tackle will wrap into the hole for the “point” linebacker. The quarterback will read the backside defensive end to determine if he will hand the ball off to the running back or if he will keep the ball to run the option. If the defensive end comes up field or sits, the quarterback will give the ball the running back to run the counter trey scheme. If the defensive end crashes and gets in the pocket of the pulling tackle, then the quarterback will keep the ball while running the option, where he will now read the outside linebacker or strong safety. If the outside linebacker or safety attacks the quarterback, the quarterback will throw the ball to the wide receiver that is running the bubble route. Yeast teaches the receiver that is running the bubble to backpedal and stay one or two yards behind the quarterback to avoid an illegal forward pass. This is a concept that will always be run from an offensive 3x1 alignment. They can get to the trips alignment by lining up that way or by motioning to it. This assists in breaking formational tendencies for the offense. The clip below demonstrates Franklin running the counter trey. The offense aligns in a balanced 2x2 formation before motioning to a 3x1 alignment. The defensive end crashes when the tackle pulls, resulting in the quarterback pulling the ball and running the option himself. Once the quarterback knows he will be the ball-carrier, he sets his eyes on the outside linebacker and reads the linebacker to determine if he will be the final ball-carrier or if he’ll throw the ball to the No. 3 receiver running the bubble. When the outside linebacker comes to attack the quarterback, he flips the ball out to the bubble receiver who is now reading the blocks from the No. 1 and No. 2 wide receivers. Below is another clip where the defensive end crashes on the running back, prompting the quarterback to pull the ball and option off the outside linebacker. Notice how the No. 3 wide receiver backpedals out of his stance to gain depth while making sure he stays behind the quarterback. Once the outside linebacker commits to the quarterback run, he flips it out to the bubble receiver who reads his blocks and gets up field. While posting two clips where the quarterback pulls the ball and runs the option that results in a pass, it’s necessary to showcase an example of the running back running the counter trey. The formation is a favorite of Lincoln Riley at Oklahoma. Split backs in the shotgun with tear motion. The tear motion runner is now the bubble runner if the quarterback pulls the ball. The defensive end on this play comes up field so the quarterback hands the ball off to run the counter trey. The defense is playing an odd front with a linebacker walked up on the line of scrimmage to the boundary. The play-side tackle will base the defensive end over him while allowing the backside guard to kick out the linebacker. This means the backside tackle is to wrap up inside the backside guard and block the “point” linebacker. The ball-carrier will get on the inside hip of the backside tackle and run off his block. 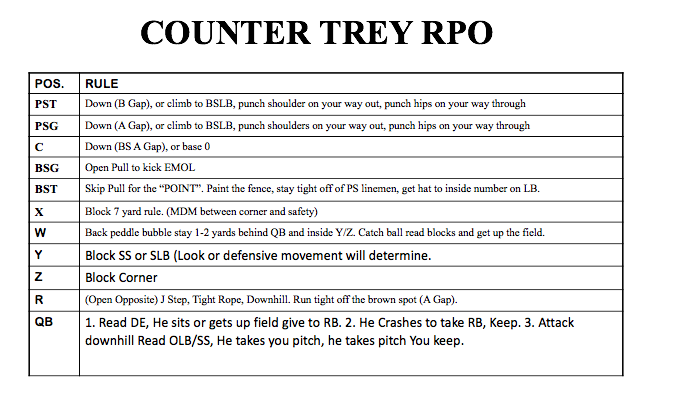 Coach Yeast achieved a lot of success with the counter trey RPO this past season. It’s a popular concept around college football that’s being run at all levels. It’s always interesting to see how the Air Raid offense has evolved with the run game over the last few years with Lincoln Riley leading the way at Oklahoma.